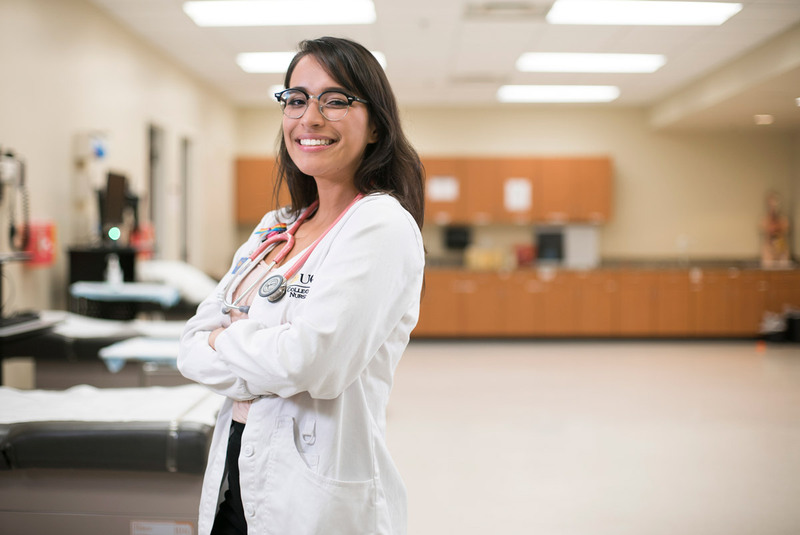 UCF’s commencement is the culmination of an amazing journey for Eliany Torrez Pon, a nursing student who is making better access to health care a priority. You can hear it in the voice of Eliany Torrez Pon. Compassion. Gratitude. Determination. It’s all there when she talks about graduating Friday with a degree in nursing, pursuing a career in pediatric oncology, and knowing first-hand the uncertain paths of “dreamers” in the Deferred Action for Childhood Arrivals (DACA) program. Torrez Pon was born in Kitchener, Ontario, Canada. Before her second birthday, she moved with her mom and dad to the United States, where she made lifelong friends, earned good grades in school and started to plan for her future as a nurse. It was the all-American story — until she sat down to fill out her first college application. It would take a year for Torrez Pon to gain DACA status, work through the complexities of her application, and to dig up her proof of schooling from pre-K through high school. Financial aid was out of the question, so Torrez Pon’s dad sold his car to pay for her first year of tuition. Through the process, Torrez Pon learned deeper details about her family history. Torrez Pon’s parents grew up in Nicaragua where, as young teens, they were merely trying to survive the war known as the Nicaraguan Revolution. There were bombs, family members missing in the turmoil, attempts to recruit school-age kids into the warring factions during the 1980s. In the midst of it all, her parents remember symbols of hope wrapped as special presents from at Christmas: tubes of Crest toothpaste and bars of Dove soap. Both parents risked their lives to secretly leave Nicaragua, too scared to even tell anyone goodbye. They escaped more than 3,500 miles north to Canada as refugees. A decade later, but before 9/11 and the onset of tighter immigration policies, they moved with their Canadian citizenships and Torrez Pon in tow to find opportunities in the land of Crest and Dove. Torrez Pon remembers nothing out of the ordinary about her upbringing in America, except for one hurdle that continually followed her family and that developed into her inspiration: basic health care. The family would forego prescriptions and instead use the home remedies her mom and dad learned in Nicaragua, most of them mixed into teas and herbs and oils. By the time Torrez Pon had her sights set on nursing school, she was also seeing families just like her own using nontraditional routes to meet health care needs. While volunteering for Shepherd’s Hope, an organization of volunteers that provides access to health care for the uninsured, she heard stories from undocumented people who had ignored medical concerns until they’d grown into serious problems. She saw families using emergency rooms as a last resort for help. On the pediatric rotations required in UCF’s nursing program, she would sit at night with children whose parents, perhaps because of language and cultural barriers, weren’t there. One thought kept her pressing forward: These people should not be going through a predicament she knew all too well. In June 2016, Torrez Pon’s resolve was tested again when she found out her grandmother in Nicaragua had been diagnosed with ovarian cancer. Her grandmother didn’t have the finances to pay for treatment, so Torrez Pon and her mother pooled all of their resources, including money set aside for college, and sent it to grandma. Five months later, Torrez Pon’s grandmother succumbed to the cancer. In her grief and out of money, Torrez Pon also came to grips with the likelihood that she would not be returning to school for a while. Then a surprise email appeared one week after Torrez Pon’s grandmother died. “At first, I thought it was spam,” says Torrez Pon. She’d forgotten about applying for the Vivian and Barry Woods Educational Endowment Scholarship, worth the exact $2,000 amount she and her mother had sent to take care of her grandmother’s medical expenses. She says there are many stories similar to hers, which helps explain why one in five DACA recipients is pursuing a career in health care. They can empathize with medical and financial difficulties of people from all walks of life. They’re family-oriented and likely to be bilingual. If they lack anything, it’s public awareness of their challenges and dreams. Torrez Pon is on top of that, too, having presented a resolution to the Florida State Nurses Convention to support the efforts of DACA recipients in the health care field. The measure passed and is now in front of nursing associations across the nation. Last summer, one more door was opened for Torrez Pon when an envelope appeared on her doorstep. When she pulled out the contents, she fell to her knees in tears while her mother jumped up and down. After a long, uncertain road, she finally had her permanent U.S. residency. Free to live out her dream in the land of Crest and Dove.